On Tuesday, officials released the results of Jamaica’s December 29 parliamentary elections, which show a landslide victory for the opposition: the center-left People’s National Party (PNP), headed by Portia Simpson-Miller. This landslide—with the PNP beating the ruling Jamaica Labour Party (JLP) by a two-to-one margin—largely surprised analysts, who predicted a tighter race. Commentators attribute the JLP’s stunning loss to disappointment with the party, and to former JLP Prime Minister Bruce Golding’s decision to extradite Jamaican drug lord Christopher “Dudus” Coke to the United States in 2010. 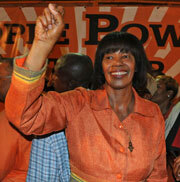 Economic problems also played a significant role; Simpson-Miller’s PNP promised supporters economic growth and job creation. The election is interpreted as a referendum on the government of Prime Minister Bruce Golding, who stepped down as leader of the JLP on October 23, 2011. He was replaced by former Education Minister Andrew Holness, who served only two months as prime minister—the shortest term in Jamaican history. According to Peter Philips, a veteran Jamaican lawmaker, “Holness was unable to persuade the electorate that the Labor Party was a different party under him.” Many analysts attribute the JLP’s loss to Golding’s decision to extradite Jamaican drug kingpin Coke to the United States on drugs and arms trafficking charges in 2010. The move came after a nine-month government campaign to lobby the United States to drop the request. The Pan American Post points to voter dissatisfaction over unresolved questions about ties between Dudus and the Labor Party, suggesting Dudus helped the JLP win votes in the Tivoli Gardens neighborhood where he held sway. Dudus’ extradition incited days of riots in Kingston, resulting in 80 deaths. “It is clear that we underestimated the devastating effect that the entire...issue had on the image of the party,’’ said Karl Samuda, a JLP leader quoted in The Miami Herald. The same article also points to a strong anti-incumbency attitude in the region, where the latest elections in Trinidad and Tobago, Haiti, Guyana, and St. Lucia all unseated incumbents. Economic issues also played an important role in the turning of the political JLP’s political tide. Unemployment in Jamaica runs at approximately 12 percent—up three points from 2007—and the country’s debt burden is around 130 percent of GDP. The 2011 GDP growth rate was an estimated 1.6 percent, following three years of economic contraction. These issues pose pressing challenges to Simpson-Miller as she assumes power on January 5. She vowed to create jobs and reestablish a pact with the International Monetary Fund, which last year approved a $1.27 billion loan to the island. “Getting sustainable growth remains the number one challenge for Jamaica,” says Girvan. Read an AS/COA News Analysis on the violence in Kingston following the announcement of Dudus’ extradition. View election results on the Jamaica Gleaner’s Election Portal.